In todays rail budget presented by Mamata Banerjee, the long awaited demand for the Belgaum – Dharwad rail line has been approved by the rail minister and work should hopefully begin on the same in this fiscal. The said new line will be in cost sharing with state government and Public Private partnership. No specif time period has been mentioned for the beginning and completion of the work in the budget. So its only a hypothetical plan still. These routes will be surveyed and the feasibility report will be submitted. Bagalkot-Kudachi new rail line has been included in this budget which means work will commence on this route during this fiscal. Adarsh Stations: Bagalkot, Gokak Road. Miraj kurduwadi link is under utilised.There should be trains betn.Mumbai Miraj via kurduwadi.Prsently there is not single train on this route. We need some more trains between Miraj-Belgaum-Bangalore. The existing Rani Chenamma reaches bangalore at 8 am. There should be some more trains which starts around 6 pm at belgaum and reaches bangalore at 6 am. Pune-Miraj-Belgaum-Bangalore-Belgaum-Miraj-Pune – This will reduce the traffic on the NH4 and the existing KK exp and Udyan exp. This train should reach Bangalore at 6 am in morning. Belgaum-Bangalore-Belgaum – Morning afternoon Intercity. It should have limited stations. Doubling of the track from Pune to Bangalore would help the addition of more trains. A track from Belgaum-Bailhongal-Hubli would curb the journey by one hour. Currently, there are two express trains but no passenger train from Belgaum to Sangli. The intermediate stations between Belgaum to Miraj are not connected to Sangli. Thousands of people travelling from Belgaum and other stations like Kudachi, Chikodi, Shedbal, Ugar, etc. have no passenger train to Sangli. They have to get down at Miraj and then take bus to Sangli. SWR railways should immediately extend Belgaum Miraj passenger trains upto Sangli. First of all lets thank to Mamata's MAMATHA on BGM for survey on BGM-SAVANTHWADI & BGM-BAGALKOT-RAICHUR rail link even though it is not implemented,coz atleast she took our city's name in her budget speech. The writer of this article has given wrong news on BGM-DWD new line,there is no mention of sanction of this project, i have not even heard about bi-weekly Kolhapur-HYD new train. Dear Mr Satish Kumar, I am impressed with you know how and indepth study on the subject and the demography. I am keen to catchup with you some time as we share comon interests and may be some part of the vision belgaum as well. Thanks Bandhu Belgaonkar , any time for Belgaum and belgaumites …. (Maa-Maati-Manus, Ee momta dii kaa montra haai) , if you have an email id forward it I will send you Belgaum blue print you can suggest and comment on same , Keep in touch, Cheers!!! 1. Bangalore -Miraj-Chandigarh – Kalka. Bengalooru-Belagaavi Distance/travell time parallel to NH4. Hope soon they will extend Janashatabdi and Intercity upto Belagaavi which are currently commencing upto Hubballi. Satish But i read a article which mentioned that the track between Belagaavi and dharwad passes through Bailhongal and Kittur, I dont know how true it is, If it goes through Bialhongal its good I feel. Its Not that long and improoves connectivity between Belagaavi and Bailhongal as well. true bailhongal is offtrack and this defeats the purpose of short straight route between bgm and dwr;a branch line can be given off to bailhongal and soundatti -than every one will be happy! lets also hope that bgm dharwad gets implemented at the earliest! In addition to these lines there is a need to lay Belgaum- Kolhapur line. Along this line there arent any forests (so no waiting for clearance from Environment Ministry) and the terrain too is not hard. There is a great humanity that travels between places like Sankeshwar and Nipani in addition to the two cities mentioned above. It is ridiculous to travel through Miraj to reach Kolhapur. I hope logic and sense prevails on the Railway Department. 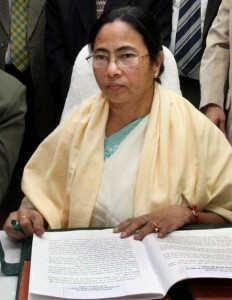 Mamta Didi you have proved that you also care for other states along with your Home State. Hope the plans are implemented Sooner. Pleased to hear this… Should reduce commute times on many north-south trains I guess, if they start bypassing Londa. Good to hear about the belgaum-bagalkot route too. Should reduce travel time to Hyd from BGM which is currently about 20 hours by the Hari Priya express! Atleast it is on the drawingboard, hopefully will matrialize pretty soon…. At last there is some good news…. Belgaum – Dharwad rail line is hypothetical plan but still we can say something is better then nothing, atleast a gud approach to start off with ! Would these trains commence through Belagaavi? @MAHANT. yes.. of course these trains would cross from BELGAUM. Currently there is a daily train on this route. Train 7416/7415. This will be additional to the existing Haripriya Express.